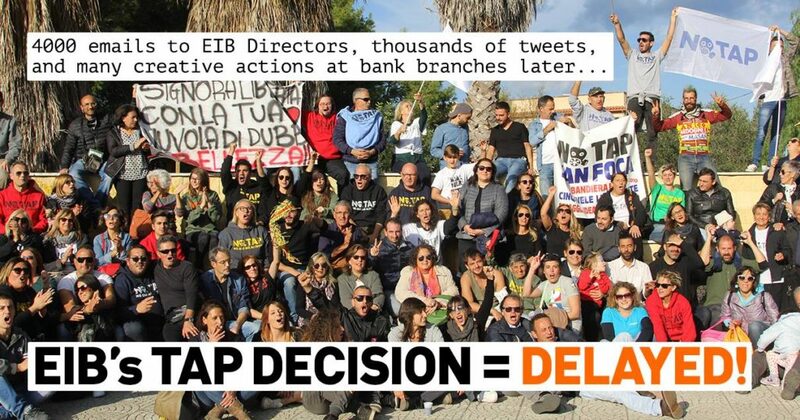 Following actions against TAP & fossil gas the European Investment Bank delayed the decision on a 1.5 billion loan to TAP until next February! The Gastivist team was instrumental in coordinating such actions. 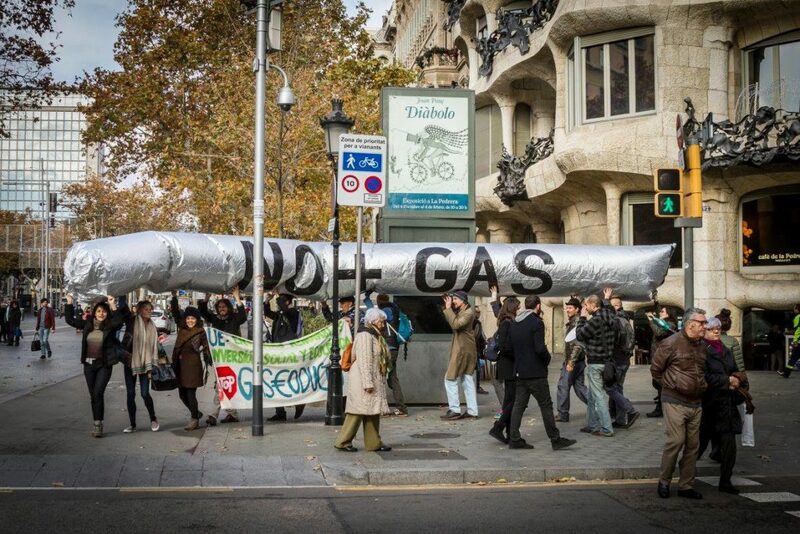 The Gastivist Collective works to empower, support and grow grassroots groups mobilizing against the expansion of fossil gas infrastructure in Europe and the Mediterranean. Gastivists are confronting the massive push for construction of new gas infrastructure that would lock Europe into fossil fuels for another generation and increase pressures on the Global South towards expansion of fracking. This is the next wave of a long history of European energy colonialism: from slavery, to sugar, to whale oil, to petroleum and now to gas. Some of the more than 77 planned European gas infrastructure projects vying for EU funding would directly pressure countries such a Algeria to increase production by engaging in unconventional extraction (such as fracking). Additionally, natural gas is methane – a greenhouse gas that in the short run is more than 100 times more potent than CO2, and remains more than 86 times more potent than CO2 over a 20 year cycle. If you frack gas, put it through a pipeline, compress it, ship it on a boat, decompress it, and put it in another pipeline – so you can lose up to 12% of the gas along the distribution chain. But international governance bases the Global Warming Potential of methane based on old IPCC reports (that look at a 100 year timeline) and so the climate impacts of gas are deeply undervalued. A Gastivist action in La Pedrera-Casa Milà, Barcelona. There are millions being spent on ad campaigns by gas companies, and despite 7 years of attempts NGOs report that no major funder has ever agreed to support gas work – so there is awareness that this won’t be easy… However there seems to be a beginning of a global movement against gas, but it does not yet see itself or articulate itself as such. It is currently in the shape of diverse struggles, with people fighting gas pipelines not networked to the anti-fracking activists fighting the wells that would supply those pipelines, or the LNG terminals that would transport it. The aim of Gastivists is to support, consolidate and strengthen the growing global gas movement at this early stage with the hope that in a few years it will be strong enough that their role will no longer be needed. Europe is responsible for 42% of global gas imports, as such one cannot speak about European gas infrastructure without speaking about exports from the US and the Global South, most notably neighbors in the Mediterranean. In October 2017 Gastivists facilitated their first conference (organised by Rosa Luxemburg Foundation) that aimed at connecting the dots along supply chains to further the understanding of direct solidarity between North and South struggles. Additionally, they aim to bridge the gap between top-level NGOs working on EU policy with grassroots groups, to allow for both to have greater impact. Currently their main allies are in Sweden (Fossilgas Fällan), Ireland (Not Here Not Anywhere), France (Attac), UK (Reclaim the Power), with others in Morocco, Tunisia, Italy, Algeria and counting. 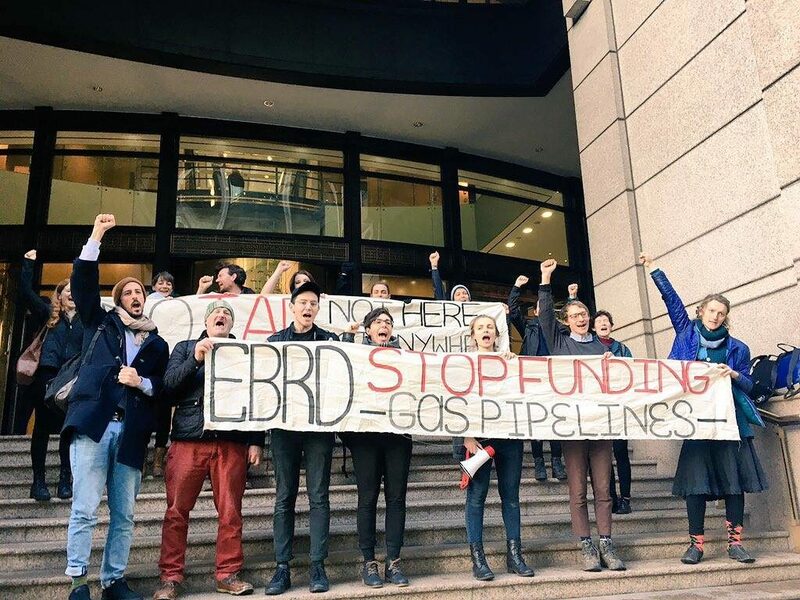 Gastivists protesting at the European Bank of Reconstruction and Development (EBRD) in London. They want the bank to commit not to fund the TAP mega gas pipeline. Over the next year, Gastivists are going to support and empower activists working on gas across Europe and the Mediterranean to start to understand themselves as part of an interconnected and international anti-gas movement through facilitating coordinated action(s). This mobilisation will be supported with informational presentations and campaigning trainings designed to facilitate the building of new local groups, providing ongoing support to local groups and connecting new groups to existing groups fighting along the same supply chain. The Guerrilla grant will go to covering such trainings, actions & events. 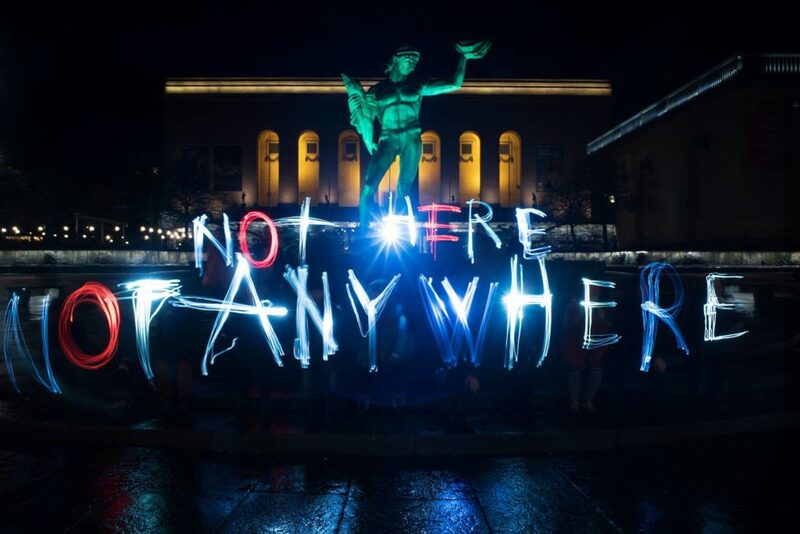 Specifically, they are working towards an International Day or Days of creative action against gas infrastructure. The exact format has yet to be agreed upon but at the meeting in October there was wide support for such coordinated actions in mid-2018. Gastivists will provide action preparation materials, creative action ideas, and when possible in-person action trainings. Other resources will include an editable presentation that others can use to share information about gas across Europe and the Mediterranean. By focusing on supply-chain organising they hope for these actions to be mutually beneficial, facilitating coordination between groups fighting extraction in the South with groups fighting infrastructure or finance in the North. One active idea is to complement the actions with a strong focus in Europe on targeting the green-washing being pervaded by the gas industry through massive advertisement takeovers editing. It always helps to get creative with your visual storytelling. No Gas Here, Nor Anywhere!